Candy hearts? Chocolate hearts? Those are the sorts of staid, boring Valentine’s ideas that no one could get excited about. We want to talk about actual hearts here. Listen up, heart is often an under-appreciated protein. It has a wintery, slightly gamey taste so that it can, for example, add wonderful depth to meat sauces. But some chefs are also getting adventurous enough to let it stand front and center in their dishes. Here are five from around the country you should get brave enough to try. Chefs and expert charcutiers Kurt Guzowski and Thomas Rice wanted to try a pasta with blood in it, and they found that adding heart made perfect sense. James Beard Award winner Tony Maws adds Armagnac, sage and the cartoonish-looking but wonderfully meaty-tasting cèpe mushrooms to his heart-and-sausage ragout and serves it over a faro flour straccetti pasta. Matt McCallister, from the current crop of Food & Wine Best New Chefs, just got the very first green strawberries of the season—less ripe and tarter than the summer berries you might be used to. He’s putting them to work immediately with grilled duck hearts. 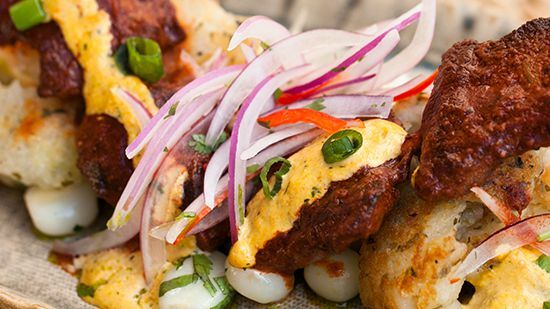 In Jesus Delgado’s home country of Peru, beef heart is the most popular meat used in anticuchos, a sort of Peruvian kebab. He serves his with a spicy chile cream.